You remember I put the call out a few weeks ago for pictures of ways you little geniuses had incorporated Pittsburgh love into your weddings? Well, you did not disappoint! You must go check out the gallery we put up of your submissions over at Pittsburgh Magazine. From Mister Rogers to Penn Mac to Eat n’ Park to Dan Marino. I would love to do another post like that, so if you’ve got wedding pictures to share, email them to me at virginia [at] thatschurch.com. I’m also always on the lookout for amazing Pittsburgh-inspired tattoos! I’m greedy like that. I don’t know who Snyder is, but that bride appears to have married Jim Lokay. I thought the same thing when I saw them skating at PPG Place. 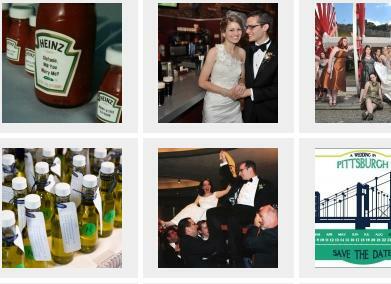 Just checked out the link for the Pittsburgh weddings…. Such awesome ideas that now I want to get married!!!!!! For the record, I’m terminally single. Maybe I can have a self-uniting ceremony and use some of these awesome ideas plus the ones I’ve already been saving up! I didn’t even notice my cousin Jack’s Steelers yarmulke until I read your caption. Excellent catch. And all of the photos are pretty awesome, by the way. You know how you know when you are old??? When you see pictures like these and you think that when your kid gets married these would be great ideas. Great ideas! We had the Pittsburgh themed swag bags for our out of town guests as well! Thanks for including our pictures! Palmieri, however, is my maiden name. I guess mistaken identity was the only way for my husband to take my name LOL! The Steelers yarmulke is awesome BTW. This is awesome, but I have a question. What is a groom’s cake? Or, maybe, WHY is a groom’s cake? Sincere question. New thing? Relation to cookie table? Different from wedding cake? I always thought a groom’s cake was pretty much only a southern tradition, but it looks like it’s headed north! Traditionally, it was supposed to be a gift from the bride to the groom, and is usually a dark (chocolate or liquor-flavored) cake that can be served at the reception(giving folks a choice between the traditional white wedding cake or a different-flavor groom’s cake) or at the rehearsal dinner. The trend is to decorate the cake in some theme that relates to the groom — his occupation, favorite hobby, alma mater, favorite sports team, etc. Some pretty cool things in there…..specifically the Iron City cake, but I always thought it was kind of corny to do the terrible towel thing or wear jerseys. To each his own though…. i assure you, my husband is not jim lokay. doppleganger, maybe?! and funny thing someone mentions jersey’s being corny at weddings. i tend to agree, in moderation. those jersey’s were on for approximately 90 seconds, 75 of which were while we were waiting to be introduced. we walked in, across the dance floor where my bridesmaids were waiting for me. the dj had been given instructions to stall before putting our first dance on because i was NOT going to have first dance pictures wearing jersey’s. my bridesmaids teamed up to get the jersey off of me quickly, efficiently and most importantly: without messing up my hair! Oh my God! People wearing team jerseys. Nobody tell Scott or we’ll have to go through that whole mess again. 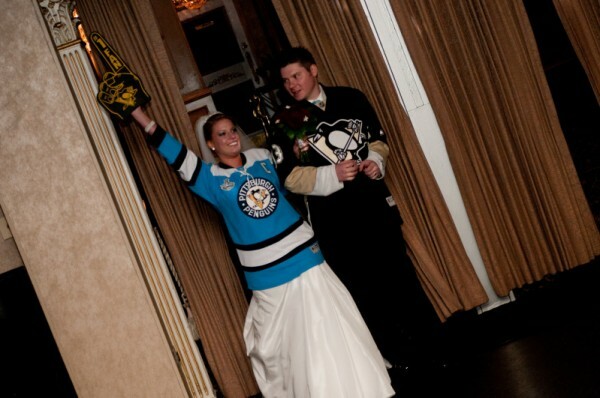 When my cousin got married their colors where black and gold and the table markers were cutouts of Steelers Jerseys. The tables weren’t numbered 1,2,3,4… they were each the number of a player, which made it a LITTLE hard to find your table.